If you are looking for an awesome vacation to the South, you should be thinking Charleston, South Carolina. And if you are bringing the RV then Oak Plantation RV Campground should be on your list! Since 2017 ended up not so great for my beloved Yellow Jackets and no football bowl game, it was time to look for other options for the end of the year. This is not something I am all that accustomed to, so I decided to go the easy way out. I went where I had family. But of course, I have this snazzy new RV that I need to use, not to mention learn all the new bells and whistles. And it’s a fun toy. So this trip is both a shakedown trip and a fun sight-seeing trip with family. And thus, a trip to Oak Plantation RV Campground, conveniently located to both family and downtown Charleston attractions. Oak Plantation RV Campground is located on Highway 17, at the end of Main Road. This is the road that will take you into Kiawah Island, the home of the 2012 and the upcoming 2021 PGA Golf Championships. Golfers know all about the Ocean Course at the Kiawah Island Golf Resort. Foodies also know about the Ocean Course restaurant. You can also enjoy a nice spa visit at The Sanctuary. The Campground is also about 11.5 miles from the City Market in downtown Charleston and 14.5 miles to Fort Sumter and Patriots Point. Do note that Highway 17 can get quite busy and backed up during the evening rush hours, so plan on being extra patient getting in and out of the campground in the evening. Or during prime time or events on the Islands. The major alternative to Oak Plantation RV Campground in close proximity to both the city and the best golfing is James Island County Park. But from mid-November to the end of December, I would not recommend it. James Island County Park is home to the Festival of Lights. It might sound cool to camp in the middle of a holiday lights festival, but you won’t be able to get back to your RV after dinner each night. The traffic is horrible! Plus there is a seven night limit for RV stays during this period. Since I didn’t want to setup and break-down multiple times during this trip, James Island County Park wasn’t a good option for me. Oak Plantation has over 200 RV spots, most with power and water. They also have a lot of full hook-up sites and pull-thru sites for your larger rigs. If you go without the sewer connection at your site, there are a couple of dump sites with water for flushing your tanks. The whole campground is pretty level and so are the spots. Some are full concrete pads, while other spots are gravel or grass. You are pretty close to your neighbors – this is a suburban spot with a lot of spots, not a boondocking or camping area. So be kind, especially with quiet hours (10 pm to 7 am). Most spots are going to have good views of the southern sky for satellite dishes. This is particularly true of the spots in the northeast quadrant of the campground. The other areas have trees, although some areas more sparsely than others. If you are going to be using satellite dishes at the campground, be sure to tell them when you make your reservation so they can give you an appropriate spot. The campground also has cable. The Campground has two bathhouses that are clean and appear to be well maintained. With it currently being winter, you’ll be happy to know that the women’s restroom (and I would presume the men’s as well) has a oil filled radiator to keep it warm. No one wants to get out of the shower into a cold room! I also spotted an actual public telephone near bathhouse #2 – no promises on whether it actually works or not. You can buy propane on site. Across the street, but on the same side of Savannah Highway, is a nice Speedway, with convenient truck/RV lanes for diesel and a nice, large canopy for your gas powered rigs. Wifi seems pretty solid on site, definitely when compared to most campgrounds. Of course, now that I say that, I am having trouble getting my photos backed up. But with the awesome location, you’ve also got great cellphone coverage from all the major carriers. Oak Plantation RV Campground welcomes pets. Burdell has enjoyed his stay here, with lots of new things to smell. There are trees and a good size unimproved area along the western side of the campground. This is a great area for a quick walk and to let the dogs do their “business.” For longer walks, you can do circuits around the RV parking loops. And most awesome of all – the dog run, an area that the dogs can run off-leash. For More RV Dog Life information, visit the RV Tailgate Life “It’s an RV Dog Life” Pinterest Board! The dog run is a large open area, some shady and some sunny and all fenced in. It’s large enough to play a few games of fetch and let the dogs get the wiggles out. It has a convenient picnic table for human companions. And a ammunition station (aka water bowl) for our four legged friends. This would be quite helpful during hot summer Charleston days and even appreciated in December. There is a basic playground with swings, a climbing arch, and what not. The campground also has a large outdoor chess set, horseshoes, and a Frisbee/disc golf course. There is a pool available for use during the warmer months. On the eastern edge of the campground, we (me and the dog) even saw some cows. The Campground also has a fishing lake on site. You don’t need a fishing license to fish here. You can also keep what you catch. But a word of caution, this is alligator country. Wild alligators do at times inhabit the pond here, so be on the lookout, especially with children or pets near the pond. If you want to go swimming, use the pool instead of the pond. I give Oak Plantation RV Campground a good thumbs up. You can’t beat the location, with easy access to all the fun that Charleston, South Carolina has to offer. A word to the wise though: you’ll want to either tow a car to Charleston or hit up your friendly car rental place. Everything in Charleston is a hike. You’ll rake up a lot of Uber/taxi fees if you rely on their services. Fortunately, the RV spaces at Oak Plantation RV Campground are good for up to 2 additional vehicles. Kimberly is the owner of a Tiffin 34PA and the former owner of Starter RV, a 1990 Winnebago Chieftan. She can be found cheering for Georgia Tech, traveling the world, or working on the RV (because there's always something to do on the RV). Don't ever underestimate what she can whip up in the kitchen or accomplish on no sleep. Find out the latest from Kimberly by signing up here. RV Bloggers: People Are Stealing Your Pins! RV Tailgate Life © 2019. All Rights Reserved. 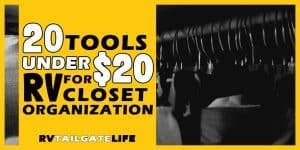 Are you Ready to Tailgate? 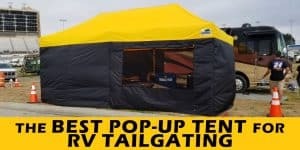 Want to be the first to know about new RV tailgating news? Get information from The RV Tailgate Life directly in your inbox. 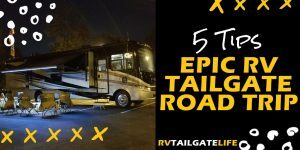 The Best Tailgate is an RV Tailgate!